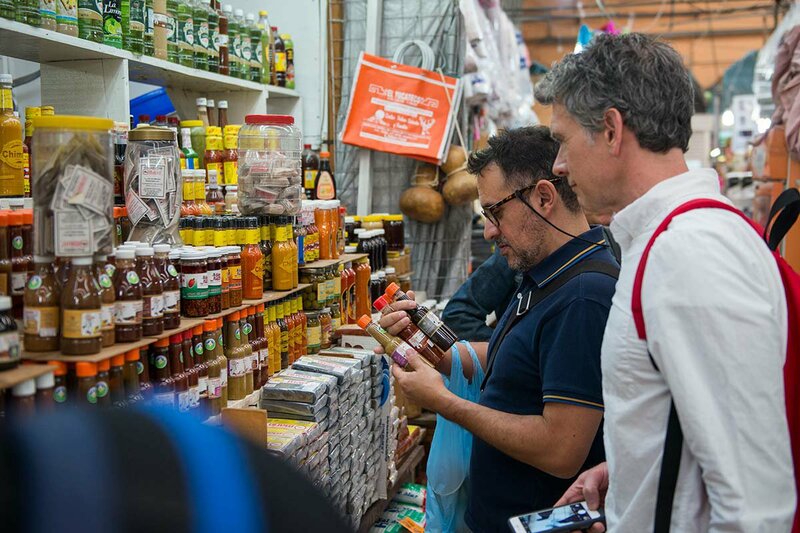 Richard and a friend selecting salsas in Mercado de Medellin. Photo by Adam Wiseman. Culinary and design consultant Richard Ampudia was born in Mexico City and now helps shape Mexican restaurants in the US, like the new midtown outpost of in Manhattan, in Brooklyn, and in Miami. But his ties to his hometown remain strong, so we were only too glad to get his little black book for his favorite spots in the D.F. for tacos, margaritas, and mariachi. To the untrained eye it looks kind of divey, but it's actually a pricey taqueria with a pedigree. My favorite items are volcanes, crispy tortillas topped with grilled steak and melted cheese. The best seat is at the counter where you can observe the chefs slicing and dicing taco ingredients. Don't forget to ask for salsa especial de la casa and plain grilled knob onions. An old-school cantina where the food is nothing special and the fried snacks and spicy stews are engineered to keep you drinking all night long. Go for the atmosphere: beautiful oil paintings of bulls grazing and old matador costumes encased in glass. The locals-only spot is reminiscent of an era when downtown Mexico City was the place to party. Enjoy a perfect margarita and homemade potato chips on the patio of the landmark hacienda restaurant. The service is impeccable, but the food is dated and overpriced, so stick to the margaritas and salty snacks. There are three quesadilla stalls at the eating market in Coyoacan. They are all awesome, but my favorite is on the back left side of the market. It's run by a Mexican señora who watches her employees like a hawk as she makes hundreds of quesadillas a day, always with a smile. Order a zuchinni blossom quesadilla — and make sure they're fresh from the fryer. For a true taste of Mexico as it used to be, visit the giant cantina where five to six mariachi bands play at the same time, the tequila flows, and people sing, cry, and remind everyone about what makes us Mexican. 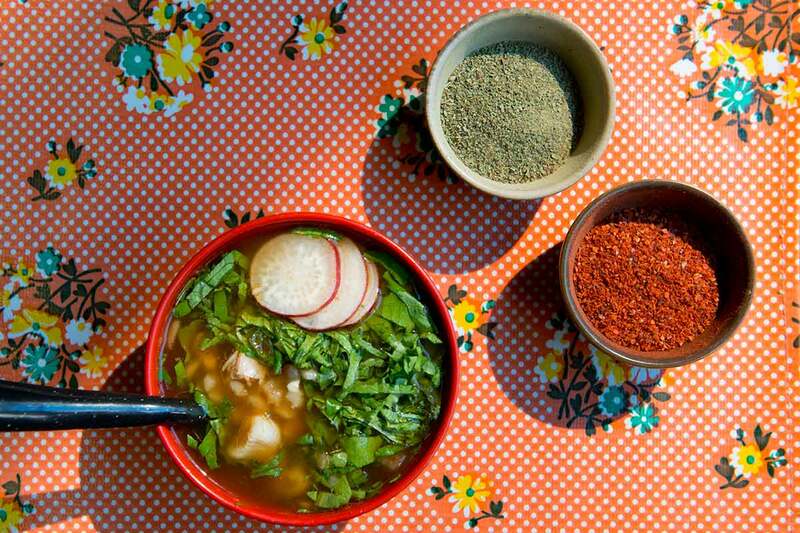 A bolw of pozole (Hominy Stew). Photo by Adam Wiseman. In San Ángel, the magic of the colonial-era church and cobblestone street gives visitors a sense of what life was like in the late 1800s, when my grandmother grew up there. Spend a Saturday visiting the folk art market and a cantina. If you're feeling brave, check out the mummy exhibit. Plaza de la Constitución, Centro. All three eras of Mexico — the Aztec empire, colonial Mexico, and modern Mexico — come together in total chaos at one of the world's largest public plazas. During the day it can feel overwhelming: Traffic and millions of people make it hard to appreciate the magnitude of the plaza. At night you can go to , order a drink on the roof terrace, and observe the majesty of the surrounding buildings. An incredible piece of architecture by visionary Juan O'Gorman. Better know as a painter than as an architect, he was quite young when he designed the studios where Diego and Frida shared their happy married period. 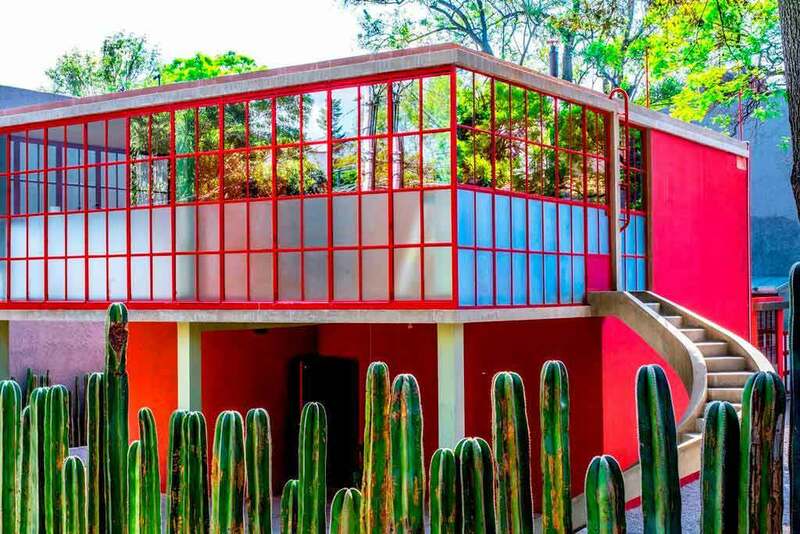 At the time, the architecture was ultra modern and very Mexican — part Bauhaus, part California — and showcased a touch of Mexican minimalist landscaping. Bring your own food, rent a little boat, ride the canals, and get a feel for Mexico City, pre-Spanish conquest. Locals purchase plants for the garden at the local floating greenhouses. I love this market for Yucatán-style salsas and exotic fruits, which, unlike all other Mexican products, have a strong Mayan influence. The cooking style is also different, heavily reliant on habanero and manzano peppers for heat. The Medellin market has become the local market for many central and South American immigrants, selling fruits and products that are not traditionally part of the Mexican pantry like manioc, star fruit, and mate. Museo Estudio Diego Rivera y Frida Kahlo. Photo courtesy of Museo Estudio Diego Rivera y Frida Kahlo. I would recommend skipping the city's hotels and booking an apartment in Condesa, which used to be a residential neighborhood, but nowadays has an eclectic mix of restaurants, bars, boutiques, and two lovely parks built in Art Deco style by Bauhaus-influenced architects. Condesa is filled with artists, hipsters, young families, and old-timers like myself who grew up here, though sadly many of the lovely old homes have been destroyed to build giant New York-style lofts. Richard Ampudia is a chef, restaurateur, designer, and professional flaneur. You can follow his restaurant projects on Instagram: Lolo's Surf Cantina, Bar Bruno, and La Esquina. He travels for the constant reminder of how to keep smiling at life's challenges.